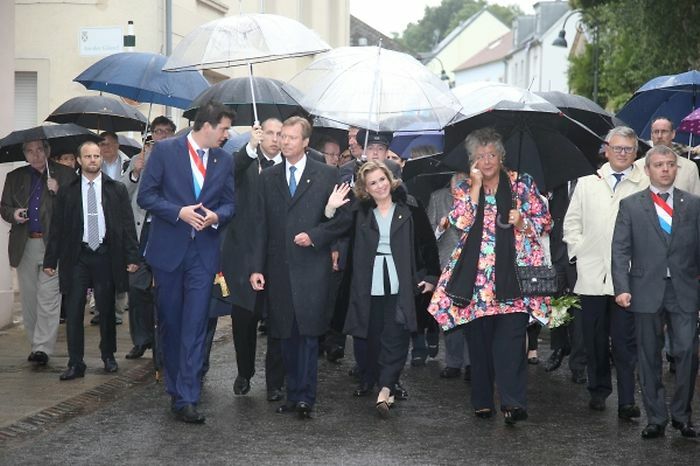 While their oldest son and his wife visited Esch, Grand Duke Henri and Grand Duchess Maria Teresa paid a visit to Mondorf-les-Bains this afternoon to mark the eve of national day. Mondorf is located in the south of Luxembourg. How far down south the spa town and home of the Grand Duchy's only casino is, can best be described as: Trip, and you'll find yourself stumbling into France. The welcome committee for the Grand Duke and Grand Duchess in the border town included its mayor Lex Delles as well as Ministers Maggy Nagel and Nicolas Schmidt. After the arrival and a short meet and greet with local authorities and the signing of the town's golden book, the Grand Ducal couple discovered a bit of Mondorf during a stroll through the old village along the Rue du Moulin. Among others, they visited the recently restored synagogue, the Burgvogt including the Foyer de l'amitié - a day centre for children, teenagers and adults with handicaps -, and the Home Saint-Louis, a retirement home. 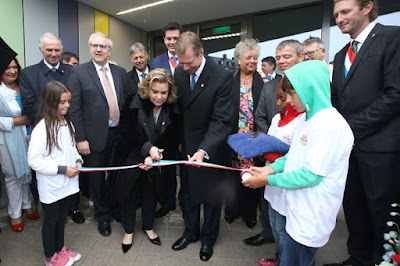 After passing the Place Bernard Weber, Grand Duke Henri and Grand Duchess Maria Teresa reached the former border crossing between Luxembourg and France, where they were welcomed by the mayor of the neighbouring French town Mondorff (with two "f" and minus the -les-Bains), Rachel Zirovnik, as well as the municipal council. Afterwards, the Grand Duchess officially opened a new part of the Maison relais, an all-day care with high flexibility for children between the ages of four and twelve, which forms a complex with the local school called the Complexe scolaire de la Grande-Duchesse Maria Teresa. After the inauguration, she also toured the new Maison relais together with her husband. As part of a festive meeting at the Bierger- a Kulturhaus building, mayor Lex Delles held a speech and Grand Duke Henri presented medals to deserving firefighters for their services. The visit to Mondorf was rounded off by a reception at the ballroom of the Bierger- a Kulturhaus where the town's people had a chance to mingle with their Grand Duke and Grand Duchess.